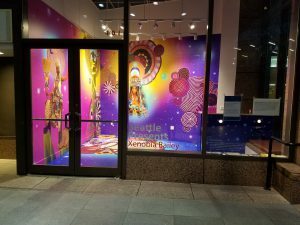 Xenobia Bailey has been featured in exhibitions at the High Museum of Art in Atlanta, and at the Stefan Stux Gallery, Studio Museum in Harlem, and the New Museum of Contemporary Art in New York. Her work is included in the permanent collection of the Schomberg Center for Research in Black Culture in New York. Xenobia Bailey creates brightly colored, tightly structured crocheted mandalas, tapestries, and poet “street wear,” combining them to form an installation that acts as a village like environment in which poets can perform. The installation consists of color transparencies laminated on neon plexiglass, lit from above with a black light.